BELAZ, a Belarus-based manufacturer of large dump trucks, has a dominant position in the mining truck market, particularly in the countries of the former Soviet Union. One of the company's key value propositions is its electric drive system, installed in its 90-tonne models and higher. Breaking into the North American heavy equipment market isn't easy, especially for offshore companies without the vast dealer networks offered by some of the bigger players like Komatsu, John Deere and Caterpillar. Having dealers in place gives customers the security of knowing that if there are problems with the main equipment or parts, a solution or a repair crew is just a phone call away. When it comes to mining trucks, the expense of the parts – a single tire can cost upwards of $40,000 – and the logistics of getting parts to mines which are usually far from any population centre, means the dealer-customer relationship is especially important. Equally important though is the quality of the truck, and its overall cost of ownership, and here is where BELAZ, a Belarus-based manufacturer of large dump trucks, stakes its value proposition as one of the world's most pre-eminent mining truck makers. Where Caterpillar dominates the mining truck market in North America, capturing an estimated 80% marketshare, in the republics of the former Soviet Union (CIS), the opposite is true, with BELAZ, a holding company with six divisions and almost 70-year-old history, owning more than 90% of the CIS market. 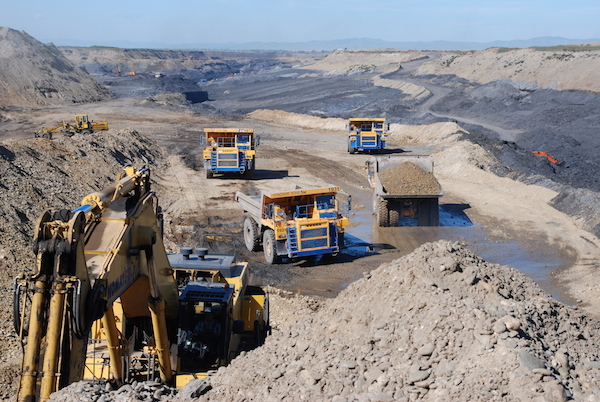 Along with mining trucks, BELAZ also manufacturers underground mining machinery, lifting and special purpose mining vehicles, rail cars and owns a machine tooling plant. The mining trucks are made and assembled at its factory in the town of Zhodino, about 40 kilometres from Minsk, the capital of Belarus. BELAZ can easily produce up to 2,000 trucks a year, ranging from a 30-tonne payload vehicle to its massive 450-tonne 7571 truck, which is the largest mining truck on the market today. BELAZ trucks can be seen moving all types of minerals in 70 countries, with the strongest markets being the CIS, Europe, Mongolia, China, South Africa and Indonesia, which recently purchased a large fleet. However the BELAZ group has yet to sell many trucks to North and South America (with the exception of a few trucks in Chile, Venezuela and Cuba), but that is something the group hopes to change. A year ago BELAZ set up an office in Richmond Hill, Ontario, with the intention of selling its first mining truck in North America. Privately-owned Belaz North America has the full backing of the BELAZ Group, which sees Canada, the U.S. and Mexico as a market it is eager to compete in, says Yuri Tarasov, executive director of Belaz North America. “They're strong everywhere else, but North America and South America, not so much. So we set up just last year, and we're going after this market full blast. We're talking to big and small and all sorts of companies that are potential customers for BELAZ, and we're gaining plenty of momentum and have lots of interest,” Tarasov told MINING.com in a recent interview. So how does an outsider get under the skin of the established mining truck insiders? According to Tarasov, the key is to support the truck buyer as much as possible, by bringing in all the necessary parts for the first year of operation, as well as support personnel. “We're all ready to put a truck for testing anywhere in this market and show our North American customers that BELAZ is a reliable option,” he said. “And since we have lots of experience doing the same thing before, we'll bring all the parts required, we'll bring all the people needed to support the truck.” He said Belaz North America has spoken with major component suppliers like Cummins, MTU, Siemens and General Electric, and all have offered BELAZ their service support network. 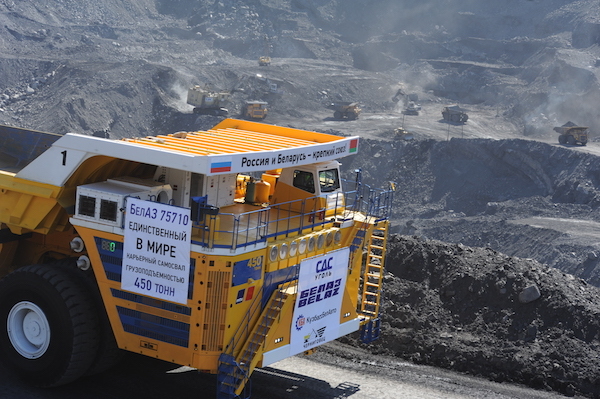 One of BELAZ's key value propositions is its electric drive system, installed in its 90-tonne models and higher. The BELAZ-7571 for example uses four electric motors to move the truck, has no hydro-mechanical transmission and uses minimum quantity of oil. The truck still relies on diesel to produce the electricity but the all-wheel- drive system is powered by two alternators, each driven by a 16-cylinder diesel engine. According to BELAZ the electric drive system reduces the cost per ton to transport materials, by operating 25% more efficiently. “That technology allows for lower fuel consumption. It allows for a smoother ride, because you don't have jerks because there are no gear shifts, so there's no rock falling off of the truck because of those jerks, and there are no tires being cut by those pieces of rock once you drive off with them. So there are all kinds of benefits,” says Tarasov. The drives are built by General Electric, Siemens and Electrosila, a Russian company. BELAZ trucks over 90 tonnes carry engines from MTU and Cummins, which supplies more engines to BELAZ than to any other mining truck maker, according to Tarasov. While the electric drives are a little more expensive than traditional hydraulic drives, BELAZ prides itself on the cost of the truck over its lifetime (total cost of ownership) being lower than its competitors. This is primarily due to the greater fuel efficiency (less fuel burn) brought about by the electric drive systems, along with lower costs associated with maintaining a truck, such as labour and tires. BELAZ also keeps maintenance costs in check by selling individual parts separately rather than lumping parts together as a more expensive component. Finally, wages in Belarus are lower than in many other parts of the world, including the United States and Europe, where competing trucks are produced. This allows BELAZ trucks to have a lower price point. 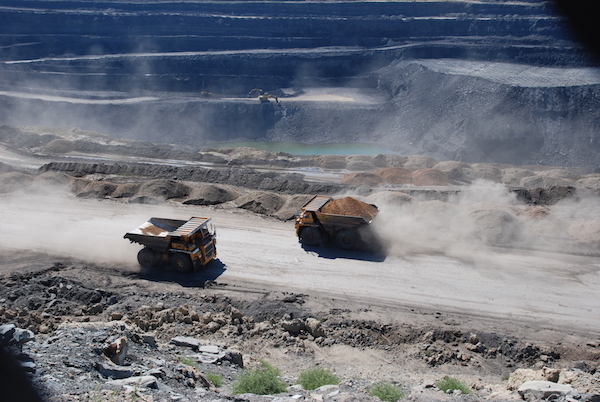 When the mining sector is flagging, equipment manufacturers usually have enough inventory to satisfy customer demand. But when the market booms, equipment makers have a tough time keeping up, and customers often have to wait for their orders, sometimes up to two or three years. Tarasov said BELAZ's assembly-line production system can more easily adjust to market demand than its competitors, resulting in shorter delivery times, even in boom periods. He said during the mining boom of the late 2000s, BELAZ was able to double annual truck production, which caused delivery time waits of a couple of months, not years. 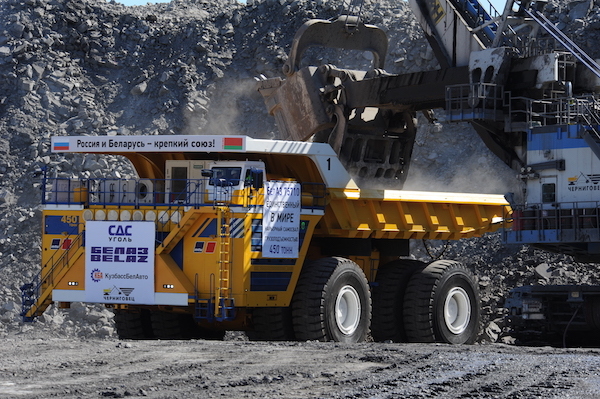 As it stands, Tarasov said Belaz North America's goal, of course, is to sell as many trucks as possible into the North American market, which includes Canada, the United States and Mexico. The two target trucks are currently the 240-tonne 7531 model, along with the 90-tonne 7558, a direct competitor with the Caterpillar 777. He sees potential in the Canadian oil sands for the 450-tonne BELAZ-7571, which can transport up to 500 short tonnes of material. “The trucks are being buried on the soft roads, and they're pushing a wave of that oil sand when they're rolling. The 450-tonne truck not only has about 25% more capacity [than its closest competitor], it burns about 10-15% less fuel, and it is all-wheel drive,” Tarasov points out. 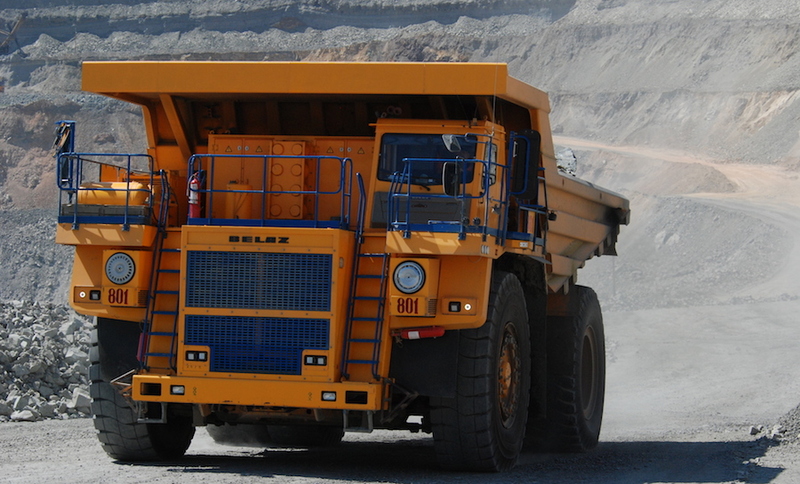 So how does the market look for BELAZ? Interestingly, while its chief North American competitor Caterpillar is closing plants and laying people off, Tarasov said BELAZ is going great guns at its factory in Belarus, pumping out more trucks to satisfy the Russian and CIS markets, which are booming right now. “They've sold out six months in advance already,” he said. 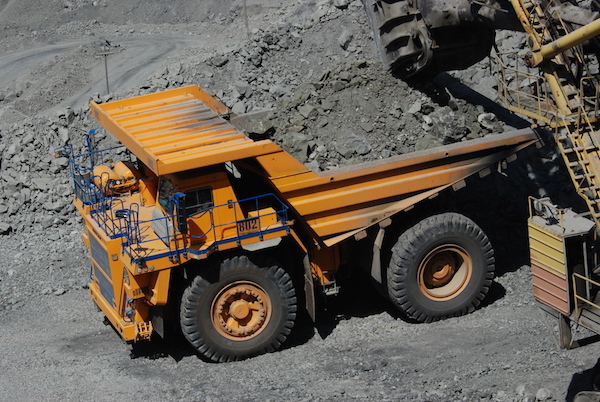 Asked about current higher commodity prices for some minerals, Tarasov said that of course is likely to boost demand for mining trucks, but what is also apparent is the need for mining companies to replenish fleets they were unable to invest in while commodity prices were down and they were struggling to remain profitable.